These past few weeks before the holidays I’ve entertained myself by perusing other folk’s stitching blogs. 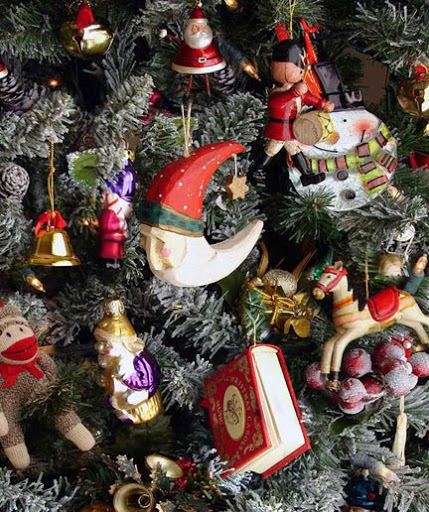 While I was looking for ornament ideas and admiring all of the fabulous trees and decorations that people created in their own homes, I realized something very surprising – I haven’t a single ornament that I stitched myself on my own tree! All of the ones I have made over the years I have gifted out to others. So I decided that next year I would choose a design and do one just for me! My own Christmas tree is decorated with a variety of things that I have collected over time, and changes very little from year to year. I could never seem to stick to just one “theme” for a tree, and so have amassed inexpensive old-fashioned glass ornaments, wind-up musical boxes shaped like instruments, simple wooden toys that evoke childhood memories, a heap of Santas and snowmen of every variety and manufacture, and even some tiny sparkly jeweled shoes! Not to mention all the lovely package and floral decorations that were just too pretty to throw away that now nestle happily within the branches, adding glamor and glitz to the greenery. But I think my favorite decoration is still the “walnut”. This little item, inexpertly painted red to look like a strawberry and adorned with a green felt “leaf” and a simple twine hanging loop, was made long ago in an elementary school art class by one of my sister’s kids. I had always thought that my nephew made it, but during her visit last month my niece claimed all of the artistic credit. Regardless of its origin it has always represented family to me more than any other bauble. It is the first thing I place on my tree each year – right at the top next to where the star will go, and the last thing I take off the tree when it’s time to take everything down. Once all of the other ornaments are safely wrapped in tissue and packed into their compartments I make sure to place the walnut on the very top before the decorations box is sealed. That way each year when I open the box I once more remember what Christmas is all about for me.